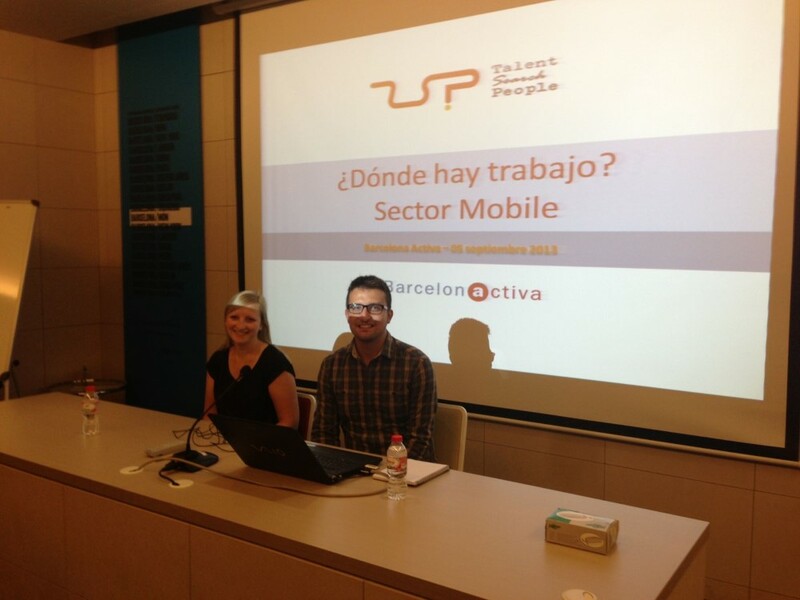 Last week, part of our IT & E-Commerce team went to the organization Barcelona Activa to givea talk about job seeking. Carlos Fernández and Vaida Revuckaite, both recruiters in that department, focused theirpresentation on job seeking in new technology companies. The conference, entitled "Onhi ha feina? Sector Mobile" (" Where is there work? Mobile Sector"), addressed issues such as what are the most demanded technical skills in the IT market, what arethe most required studies, average wages in the sector, geographical location of the majority of vacancies and profiles of the contracting companies. Also, during the event, attendees could participate actively by leaving their questions and comments through social networks using the hashtag #bcntreball. "The talk has been a success and we look forward to continue collaborating with Barcelona Activa in these types of conferences", said Fernández after his exposure. The international recruitment agency is planning to continue participating in Barcelona Activa, within future events related to HR and trainings for candidates. If you want to see more photos about the event, visit our Facebook fanpage.